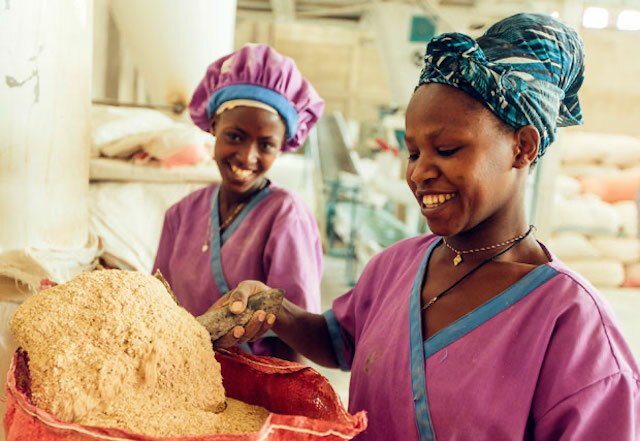 An innovative partnership is helping local food processors in Africa produce more nutritious food while improving the livelihoods of local farmers. TechnoServe and Partners in Food Solutions (PFS) – two nonprofit organizations – have developed a unique model for leveraging the private sector to promote food security and nutrition in the developing world. The partnership links business and technical expertise from multinational food companies to small and growing food processors across Africa. This model creates a multiplier effect throughout the food value chain. Enhancing the capacities of local processors allows these businesses to produce more high-quality nutritious food products, buy more crops from the smallholder farmers who supply them and drive long-term economic growth in their communities. Devex Impact reporter Adva Saldinger recently spoke with John Mendesh, General Mills’ vice president of research and development, and Brent Wibberley, director of PFS programs at TechnoServe, about the roles that the private sector and nonprofit organizations can play in furthering food security. Adva Saldinger: PFS works closely with TechnoServe – given that experience what do you feel the role of development organizations is in programs and partnerships such as this one? John Mendesh: I can talk specifically about TechnoServe. Their awareness of the situation on the ground and their eyes and ears and long history of knowing the terrain is very valuable. The kinds of transfer of wisdom and knowledge that we’re doing, given that we’re doing it remote, really requires that somebody on the ground has got their antenna up and is well-schooled in the local markets and traditions and so forth, and they’re great at that. We also like the fact that they’re also very much business oriented. They tap into what business does every day and even as a standalone NGO and that’s really what attracted us to them and it’s proven to be a good partnership. AS: What do you see as the value add of NGOs or development organizations? From your experience what do you think other organizations can do to successfully work with the private sector? Brent Wibberley: If you think about the beneficiaries, you’re helping the companies and enterprising people out there that want to do better, want to get out of poverty [and] want to have a more nutritional diet. You need to speak their language and understand what drives them and understand market dynamics and the environment and the sort of economic factors that are at play for them and the infrastructure and industries and sort of matrix they live in and challenges they’ve had. Read more from this interview at Devex Impact.